Researchers find the key to speeding up the rate of reaction of a potential catalyst for energy storage lies in making the reactive parts of the catalyst move more slowly. 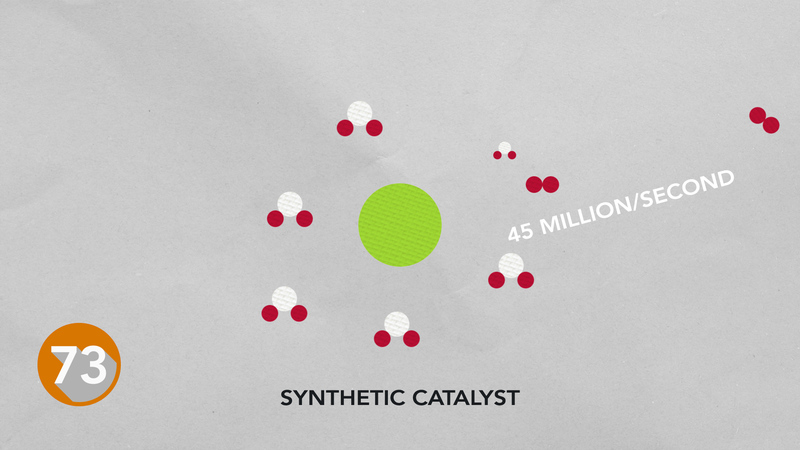 This synthetic catalyst uses an inexpensive metal at its core to produce hydrogen fast. Enlarge Image. The chemical bonds in hydrogen gas, for example, could power fuel cells, internal combustion engines or generators. Using a natural catalyst from bacteria for inspiration, researchers have now developed the fastest synthetic catalyst for hydrogen production -- producing 45 million molecules per second. Instead of a costly metal, this catalyst uses inexpensive, abundant nickel at its busy core. Why It Matters: Although the catalyst requires more energy to run than a conventional platinum catalyst, the insight garnered from this result might eventually help make hydrogen fuel in an environmentally friendly, affordable way, the researchers report in the chemistry journal Angewandte Chemie International Edition. Molly O'Hagan explores different catalysts inspired by nature, looking for one that runs fast and efficiently. Enlarge Image. 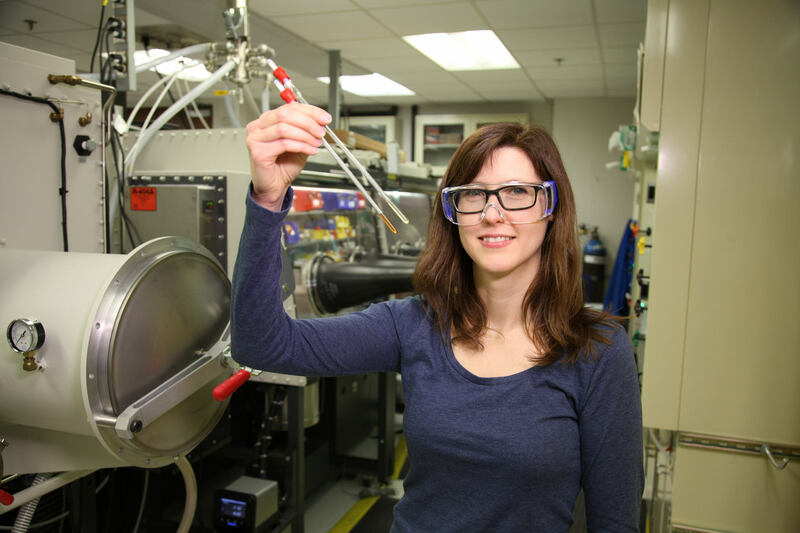 "The next thing we'll work on is making it more efficient," said chemist Molly O'Hagan at the U.S. Department of Energy's (DOE's) Pacific Northwest National Laboratory. "We still have to feed it too much electricity to produce the hydrogen." Methods: The team at PNNL has been developing a nickel-based catalyst modeled on an enzyme from nature called a hydrogenase for several years. 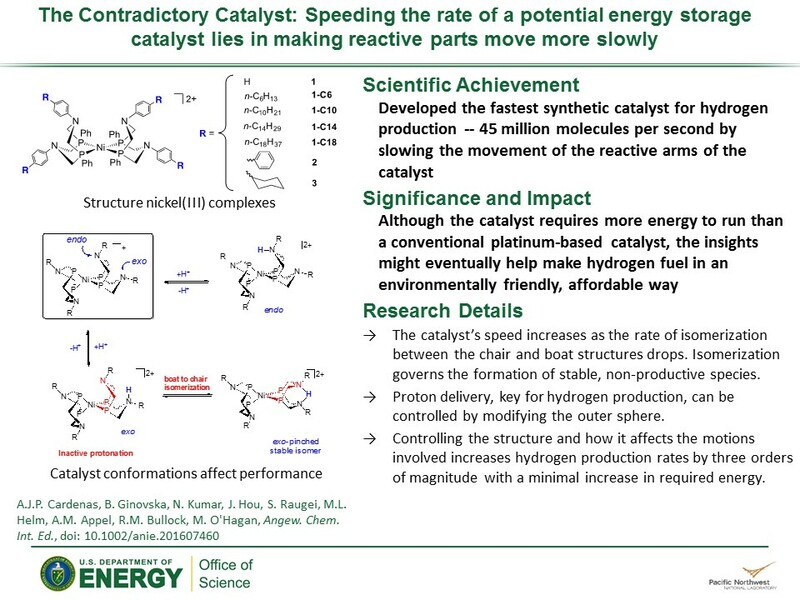 Working in the Center for Molecular Electrocatalysis, a DOE Energy Frontier Research Center back in 2011, they made a synthetic catalyst that was 10 times faster than the natural one. That natural one clocked in at 100,000 hydrogen molecules per second. What's Next? This work is part of ongoing studies at the Center for Molecular Electrocatalysis, a DOE Office of Science, Office of Basic Energy Sciences, Energy Frontier Research Center. In one sentence: Researchers at the Center for Molecular Electrocatalysis find the key to speeding up the rate of reaction of a potential catalyst for energy storage lies in making the reactive parts of the catalyst move more slowly.